Transformed codebooks are obtained by a transformation of a given codebook to best match the statistical environment at hand. The procedure, though suboptimal, has recently been suggested for feedback of channel state information (CSI) in multiple antenna systems with correlated channels because of their simplicity and effectiveness. In this paper, we first consider the general distortion analysis of vector quantizers with transformed codebooks. Bounds on the average system distortion of this class of quantizers are provided. It exposes the effects of two kinds of suboptimality introduced by the transformed codebook, namely, the loss caused by suboptimal point density and the loss caused by mismatched Voronoi shape. We then focus our attention on the application of the proposed general framework to providing capacity analysis of a feedback-based MISO system over spatially correlated fading channels. In particular, with capacity loss as an objective function, upper and lower bounds on the average distortion of MISO systems with transformed codebooks are provided and compared to that of the optimal channel quantizers. The expressions are examined to provide interesting insights in the high and low SNR regime. Numerical and simulation results are presented which confirm the tightness of the distortion bounds. This paper considers multiple antenna systems when partial channel state information (CSI) is available at the transmitter from the receiver through a finite-rate feedback link. Recently, several interesting papers have appeared, proposing design algorithms, as well as analytically quantifying the performance of finite-rate feedback multiple antenna systems [1–18]. We briefly discuss some of them below to provide context to this work. Mukkavilli et al. approximated in  the channel quantization region corresponding to each code point based on the channel geometric property and derived a universal lower bound on the outage probability of quantized MISO beamforming systems with an arbitrary number of transmit antennas over i.i.d. Rayleigh fading channels. Love and Heath [2, 3] related the problem to that of Grassmannian line packing . Results on the density of Grassmannian line packings were derived and used to develop bounds on the codebook size given a capacity or SNR loss. Xia et al. [5, 6], Zhou et al. , and Roh and Rao  approximated the statistical distribution of the key random variable that characterizes the system performance. The distribution was used to analyze the performance of MISO systems with limited-rate feedback in the case of i.i.d. Rayleigh fading channels, and closed-form expressions of the capacity loss (or SNR loss) in terms of the feedback rate , and the number of antennas were obtained. Moreover, Roh and Rao extended in [10, 11] the results from MISO channels to the case of MIMO systems with quantized feedback. Narula et al. related the quantization problem to rate distortion theory, and obtained an approximation to the expected loss of the received SNR due to finite-rate quantization of the beamforming vectors in an MISO system with a large number of antennas . Furthermore, design and analysis of finite-rate feedback based multiple antenna systems have also been extended to multiuser areas in [17, 18], where efficient multiuser CSI feedback schemes were proposed and interesting observations of feedback requirement for MIMO broadcast channels were reported. Despite all these recent results, the analysis of finite-rate feedback systems has proven to be difficult. All the aforementioned approaches are case specific, limited to i.i.d. channels, mainly MISO channels, and are hard to extend to more complicated schemes. Recently, in our work , a general framework for the analysis of quantized feedback multiple antenna systems was developed using a source coding perspective by leveraging the considerable work that exists in this area, particularly high resolution quantization theory. Specifically, the channel quantization was formulated as a general finite-rate vector quantization problem with attributes tailored to meet the general issues that arise in feedback based communication systems, including encoder side information, source vectors with constrained parameterizations, and general non-mean-squared distortion functions. By utilizing the proposed general framework, performance analysis of a finite-rate feedback MISO beamforming system transmitting over spatially correlated Rayleigh flat fading channels was provided in . The general framework developed in  is versatile and has the potential for being adapted to deal with a variety of problems. This methodology, with suitable modifications, is used in this paper to enable the distortion analysis of a wide class of vector quantizers with transformed codebooks. Transformed codebooks are often used for simplicity and are obtained by a transformation of a given codebook to best match the statistical environment at hand. The procedure, though suboptimal, has recently been suggested for CSI feedback-based multiple antenna systems because of their simplicity and effectiveness. Love and Heath  and Xia and Giannakis  proposed a beamforming codebook design algorithm for correlated MIMO fading channels using a rotation-based transformation on the codebooks of the beamforming vectors originally designed for i.i.d. fading channels. The rotation is derived from the channel correlation matrix. However, to the authors' knowledge, limited analytical results are available characterizing the performance of transformed channel quantizers for multiple antenna systems with finite-rate feedback. In this paper, we focus our attention on investigating the effects of codebook transformation on the performance of multiple antenna systems with finite-rate CSI feedback. The contributions of this paper are twofold. We first provide insight into the general problem of analyzing a vector quantizer with transformed codebook. Bounds on the average system distortion of this class of quantizers are provided. It exposes the effects of two kinds of suboptimality introduced by the transformed codebook on system performance. They are the loss caused by the suboptimal point density and the loss due to the mismatched Voronoi shape. We then focus our attention on the application of the proposed general framework to providing capacity analysis of a feedback-based MISO system with spatially correlated fading channels using channel quantizers with transformed codebooks. In particular, using system capacity as the objective function, upper and lower bounds on the average distortion of MISO systems with transformed codebooks are provided and compared to that of the optimal channel quantizers. It is shown that the average distortion of CSI quantizers with transformed codebooks can be upper and lower bounded by a scaling of the distortion of optimal quantizers. Furthermore, based on numerical and simulation results, the scaling factors are shown to be close to one for fading channels whose channel covariance matrix has small to moderate condition numbers. Preliminary version of these results have appeared in . This paper provides more detailed (and complete) derivations along with discussions that could not be included in  due to space limitation. Multiple antenna systems with finite-rate CSI feedback were formulated as a generalized fixed-rate vector quantization problem in  and analyzed by adapting tools from high resolution quantization theory. In order to facilitate the understanding, we briefly summarize in this section some important results of the distortion analysis of the generalized vector quantizer (for readers that are familiar with the general distortion analysis provided in , the current section can be skipped without loss of continuity of the article). Extension of the distortion analysis to quantizers with a transformed codebook and its application to CSI-quantized MISO systems are provided in Section 3 and Section 5, respectively. The point density function and the normalized inertial profile are the key characteristics that can be used to describe the behavior of a specific quantizer. Alternately, given a vector quantizer, one has to find these two functions, as indicated in , and the average system distortion can then be obtained using (2). where is an orthonormal matrix with its columns constituting an orthonormal basis for the null space . Lastly, the multidimensional integrations used in evaluating the average distortions are over the constrained space . In certain situations, the underlying source distribution or the distortion function of the source variable varies during the quantization process. It is practically infeasible to design separate codebooks optimized for every different source distribution and distortion function, or the encoder and the decoder may not have the ability to store a large number of codebooks. In these situations, it is convenient to use a quantizer whose codebook is constructed by a transformation of a fixed codebook based on the current statistical distribution of the source variable. These types of quantizers are generally called transformed quantizers [22, 23], and have been used in the conventional source coding area with a linear orthogonal transformation followed by a product quantizer. We provide in this subsection an analysis of the generalized vector quantizer, which is described in Section 2, when a transformed codebook is used. Detailed applications to finite-rate feedback MISO systems with a transformed codebook over spatially correlated fading channels are provided in Section 5.
where is an orthonormal matrix whose columns constitute an orthonormal basis for the null space . Compared to the optimal point density given by (8), which corresponds to the optimally designed codebook, given by (11) is always suboptimal and hence leads to performance degradation. The other suboptimality arises from the constraints on the code points in the transformed codebook in the sense that the Voronoi shape of the transformed code is not matched to the distortion function , and hence is not optimized to minimize the inertial profile. Note that these two suboptimalities, named as point density loss and cell shape loss, were also discussed in  in the setting of the conventional product quantizers and further applied to study the distortion performance of conventional quantizers with transformed codebooks. where is the optimal Voronoi shape of the original codebook corresponding to distortion function . Due to the suboptimality of encoder , the normalized inertial profile of the transformed Voronoi shape is upper bounded by the inertial profile of given by (15), but lower bounded by the inertial profile of the optimal Voronoi shape corresponding to the distortion function . where is an orthonormal matrix with its columns constituting an orthonormal basis for the null space . Due to the constraints on the code points in the transformed codebook , which cannot be optimized to minimize the normalized inertial profile, it is evident that the transformed inertial profile is lower bounded by the optimal inertial profile given by (5). Hence, inequality in (16) can be obtained after some manipulations. The same reasonings are valid for inequality in (17) for the constrained source. which corresponds to inequality in (16). which corresponds to inequality in (17). Similar to conventional product transformed quantizers , there exist trade-offs between the two suboptimalities: point density loss and Voronoi shape loss. To be specific, it is always possible to find a transformation such that the transformed point density matches exactly the optimal point density . However, by doing so, the transformation might cause shape loss of the transformed Voronoi cells in some cases, which will lead to significant increase in the normalized inertial profile. Therefore, a transformation that optimally balances two types of losses should be employed. This tradeoff is directly reflected in the distortion bound where both and in (24) depend on the transformation . So is the distortion bound given by (25). where is the received signal (scalar), is the additive complex Gaussian noise with zero mean and unit variance, and is the correlated MISO channel response with distribution given by . For the sake of fair comparisons, we normalize the channel covariance matrix such that the mean of the eigen values equals one (equal to the i.i.d. channel case ). Moreover, the statistical information (i.e., channel covariance matrix ) of the MISO channel response is assumed to be perfectly known at both the transmitter and the receiver. The transmitted signal vector is normalized to have a power constraint given by , with representing the average signal-to-noise ratio at each receive antenna. where is the channel direction vector given by . was proposed in [6, 13] where is a fixed matrix which depends on the channel covariance matrix . Distortion analysis of CSI-quantizers with transformed codebooks is provided in next section. In order to facilitate understanding, a top level diagram of a MISO beamforming system with finite rate CSI feedback is shown in Figure 1. The exchange of the CSI information between the transmitter and receiver is demonstrated. Major modules of the channel quantization process are also depicted. System diagram of a MISO beamforming system with limited CSI feedback. This performance metric was also used in [11, 19]. From an information theoretical point of view, a CSI feedback scheme should be designed to minimize this performance metric. By utilizing the distortion analysis of the transformed codebooks provided in Sections 2 and 3, this section provides an investigation of the capacity loss of a finite-rate CSI-quantized MISO beamforming system over spatially correlated fading channels, that uses transformed CSI quantizers. where is the instantaneous channel power given by . Due to space limitations and to avoid overlap with our previous work, the derivations in this subsection have been condensed by skipping some manipulations used in obtaining the final expressions. Please refer to [19, 25] for more details. In this case, by choosing matrix as with matrices and obtained from the eigen-value decomposition of the channel covariance matrix, that is, , one can generate a transformed codebook whose point density is equal to the optimal point density function . By utilizing this codebook transformation, there is no distortion loss caused by the point density mismatch (when is large). However, the system still suffers from the suboptimal Voronoi shape due to the transformation. where is the optimal inertia profile given by (35). It is evident from (43) that except for unitary rotations of the i.i.d. codebook, any nontrivial transformation of codebook will lead to mismatched Voronoi shapes and hence causes inertial profile loss. Therefore, a codebook transformation that makes the best compromise between the point density loss and the inertial profile loss is favored. In order to assess the suboptimality caused by codebook transformation, one would like to compare the system performance in terms of the average distortion of quantizers using transformed codebooks with that of the optimally designed codebooks. Interestingly, in high-SNR and low-SNR regimes with a large number transmit antennas , the average system distortion of CSI quantizers with transformed codebook can be upper and lower bounded by some multiplicative factors of the distortion of optimal quantizers. Note from Proposition 2 that constants and can be viewed as the upper bounds of the penalty paid for using a transformed codebook instead of the optimal design. Numerical examples of the loss factors and as well as corresponding discussions are provided in Section 6. The proposed system distortion bounds, as well as the corresponding observations made in previous sections, are all derived based on the high-resolution assumption. However, the feedback rate of the channel state information is always constrained to be low (a few bits per channel update) due to various practical considerations, for example, reduced transmission overhead, latency, and uplink spectral efficiency loss. Fortunately, as a well-known result in the conventional source coding, the high-rate distortion bounds agree well with the real simulation results when the resolution is larger than bits per dimensions ( ) . In this paper, due to "log-like" nature of the distortion function (system capacity loss), the distortion bounds converge even faster (about bits per dimension), which is verified by simulation results in the following section. Therefore, the proposed distortion lower bounds are tight, and hence are able to characterize the system performance well even for CSI quantizers with small to moderate quantization rates. Some numerical experiments were conducted to get a better feel for the utility of the bounds. Figure 2 shows the system capacity loss due to the finite-rate quantization of the CSI versus feedback rate for a MISO system over correlated Rayleigh fading channels under different system SNRs, and dB, respectively. The spatially correlated channel is simulated by the correlation model in : a linear antenna array with antenna spacing of half wavelength, that is, , uniform angular spread in and angle of arrival . Simulation results of both the optimal designed codebook using the minimal mean-squared weighted inner product (MSwIP) criterion proposed in , as well as the suboptimal transformed codebook, are plotted. For comparison purposes, the distortion lower bound given by (44) and the distortion upper bound given by (45) are also included in the plot. Note that the capacity losses ( -axis) are demonstrated using unit of bits per channel update. To get a relative sense, the channel capacity assuming perfect CSIT for the same MISO system is bits per channel update for an SNR of dB, and bits per channel update for an SNR of dB. It can be observed from Figure 2 that the distortion lower bound is tight and the performance of the CSI quantizer with transformed codebook is close to that of the optimal codebooks. 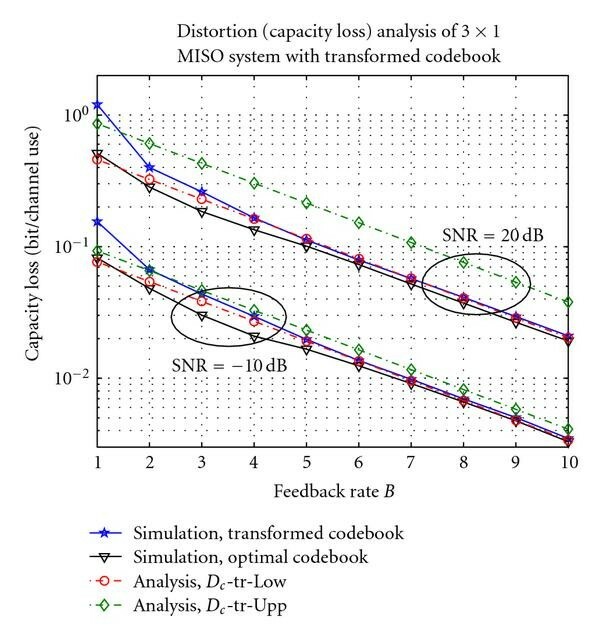 Capacity loss of a correlated MISO system with normalized antenna spacing versus CSI feedback rate using different channel quantization codebooks (optimal codebook versus transformed codebook). In order to see the effects of channel correlation on CSI quantizations, we plot in Figure 3 the normalized capacity losses (or capacity loss ratios) versus the adjacent antenna spacing of a MISO system using both optimal CSI quantizers and quantizers with transformed codebooks. In the plot, the normalized capacity loss is defined to be the distortion ratio of correlated fading channels over i.i.d. fading channels. The reasons of choosing the capacity loss ratio as a major performance metric are twofold. First, intuitively uncorrelated Gaussian distribution has the maximum amount of "uncertainty" among all possible channel distributions. It imposes greater challenges in terms of quantizing the CSI than spatially correlated fading channels. Therefore, normalizing the system capacity loss w.r.t that of i.i.d. fading channels would make this ratio a positive number between 0 and 1, which characterizes the relative quality of the channel quantizer. Second, according to (36), (39), (44), and (45), the system distortion (in terms of capacity loss) of both optimal and transformed codebooks can be expressed as a weighted exponential function given by , where is a constant coefficient that is independent of the quantization resolution . Therefore, the proposed capacity loss ratio does not depend on the feedback rate, and only reflects the impact of the channel statistical distributions as well as the type of channel quantizers used. 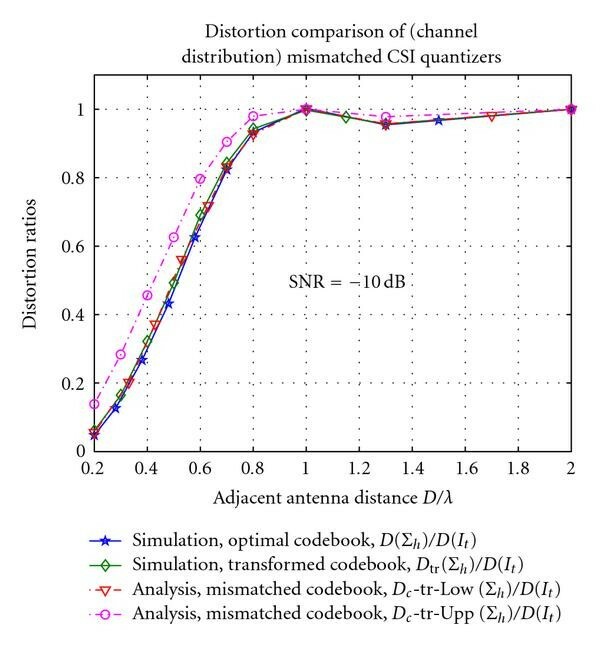 Normalized capacity loss (with respect to the capacity loss of uncorrelated fading channels) comparison of a MISO transmit beamforming with optimal and transformed codebooks versus antenna spacing , in low-SNR regimes ( ). In Figure 3, the capacity loss ratio is demonstrated with respect to the adjacent antenna spacing , which is directly related to the spatial correlation of the MISO channel response. When is sufficiently large, the channels can be viewed as i.i.d. Gaussian distributed, while means the channel is completely correlated (line of sight cases). In the plot, the average system signal to noise ratio is chosen in the low SNR regimes where dB, and the quantization resolution is bits per channel update. Simulation results in high SNR regimes, which are not shown here due to space limitations, show very similar results. Moreover, for comparison purpose, the ratio of the distortion bounds, that is, and , is also included in the plot. One can first learn from Figure 3 that the system capacity loss increases as the adjacent antenna spacing increases (channel correlation decreases). It means higher feedback rate or finer resolution of the channel quantizer has to be used to maintain the same level of capacity losses, which is consistent with our earlier intuition. Moreover, it can be observed from the plot that the transformed codebook performs very close to the optimally designed codebook across all channel correlations. Finally, the plot also indicates that the analytical bounds agree well with the obtained simulation results. Therefore, we can analytically characterize the performance of beamforming systems using transformed channel quantizers without cumbersome numerical simulations. In order to demonstrate the penalties of using transformed codebooks in high-SNR and low-SNR regimes, Figure 4 plots the constant coefficients and versus the number of transmit antennas for correlated MISO channels with adjacent antenna spacing . From the plot, it can be observed that (the upper bound of) the performance degradation caused by the transformed codebook is less than in low-SNR regimes and in high-SNR regimes for MISO systems with more than transmit antennas. This means that the intuitive choice of given in [6, 13] is a fairly good solution especially for cases when the channel covariance matrix has a relatively small condition number. 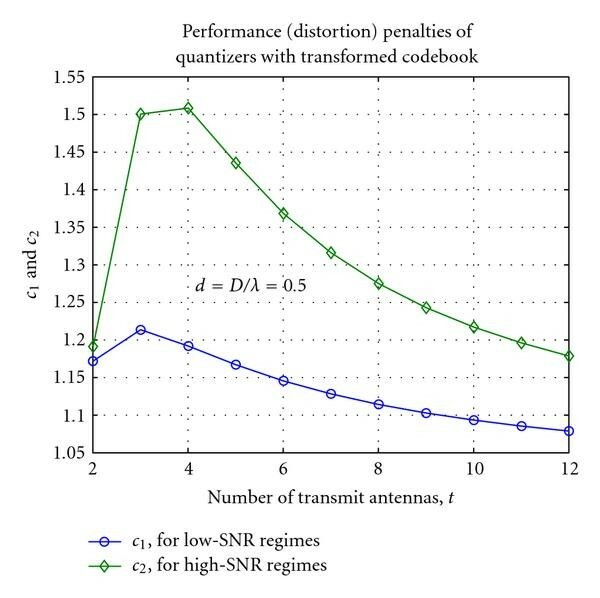 Demonstration of the distortion penalties of a MISO system using transformed codebooks over correlated fading channels with different number of transmit antennas of antenna spacing . This paper extends the high-resolution quantization theory approach to study the effects of a finite-rate MISO CSI-quantizer employing a transformed codebook while transmitting over correlated fading channels. The contributions of this paper are twofold. First, analysis is provided for a generalized vector quantizer with a transformed codebook. Bounds on the average system distortion of this class of quantizers are provided. It exposes the effects of two kinds suboptimality, which include the suboptimal point density loss and the mismatched Voronoi shape. 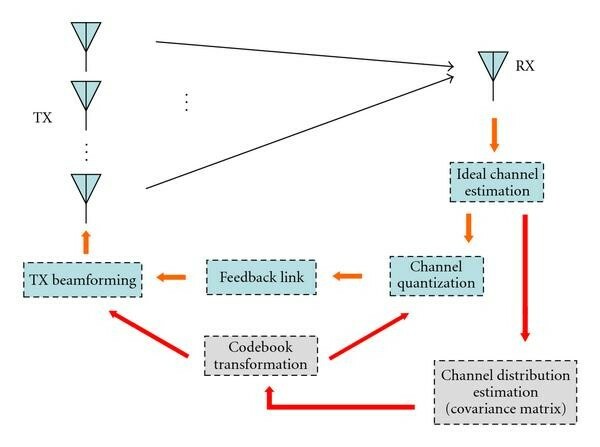 Second, we focused our attention on the application of the proposed general framework to provide the capacity analysis of a feedback-based MISO system over correlated fading channels using channel quantizers with transformed codebooks. In particular, upper and lower bounds on the channel capacity loss of MISO systems with transformed codebooks are provided and compared to that of the optimal quantizers. It was further proven that the average distortion of CSI quantizers with transformed codebooks can be upper and lower bounded by some multiplicative factors of the distortion of optimal quantizers. These factors were shown to be close to one for fading channels whose channel covariance matrix has small to moderate condition numbers. Numerical and simulation results were presented, which confirms the tightness of the theoretical distortion bounds. The authors would like to thank Chandra R. Murthy and Ethan Duni for many stimulating discussions and the critical feedback, which greatly helped with the development of this work. This research was supported in part by CoRe Grant no. 02-10109 sponsored by Ericsson, and in part by the US Army Research Office under the Multi-University Research Initiative (MURI) Grant no. W911NF-04-1-0224. Finally, by substituting (A.6) into (A.1), equality of (46) is proven. With similar reasoning, by substituting the joint m.g.f. (A.5) into (A.4) with , coefficient is obtained. Correspondingly, a closed-form expression of the coefficient , given by (48), can also be obtained, and inequality of (46) is proven. Therefore, by setting and , and substituting the joint m.g.f. given by (A.5) into the integral in (A.9), the coefficient can be obtained. It is equivalent to coefficient given by (49), and hence the inequality of (47) can be proven.